Are you and your partner an effective team? If you have seen the movie Oblivion, you will remember the line from mission control as they check in on the team operatives. Each transmission would end with the question “Are you an effective team?”. Now I do love a good sci-fi movie, but I’m not chatting about the movie in the blog. I want to ask YOU reading this article. I want to ask… Are YOU and effective team??? Keep reading and I’ll explain what I mean. The reason I say this is because we sometimes can view life as a challenge and we must fight the challenge on our own. To many people who have not fallen in love yet they can see themselves as a bit of a lone ranger. This is not how life is meant to be. You are meant to have friends, at least one in life to whom you can do life with. I’m not talking about a married partner for even as a married couple we still need friends. You see, we can take life on, on our own, or we can take life on as a team. The reason is life is easier as a team. As the saying goes “a problem shared is a problem halved”. We need to have family and friends in life. When I read articles on happiness, I have read it so many times the importance of having people in our lives to enjoy life with. Not just for the company, but for our well being. All too often married couples can live together but be living almost separate lives. Men tend to try and be strong by not talking about how they feel. This is such a mistake on mens behalf for men have emotions, feelings and shortcomings that can be easily sorted if they spoke about it. But the world tells us its not ok to talk about shortcomings, and this is rubbish. The same is true for wives but women tend to communicate their feelings better than us men. To be an effective team you must be open about everything. You must talk to your partner. Life is so much easier when you tackle problems together rather than on your own. There is no such thing as an army of one. But when the two of you function as a unit, you now become an army of two, you can watch out for each other. Married couples that have a healthy relationship (by the way healthy doesn’t mean perfect), are a force to reckon with. You can watch each others back while keeping each other on the straight and narrow. Relationships tend to break down in communication well before they separate. Keep the communication open and you will make a difference in each others lives. You will help each other grow and learn. Love is a great incubator for many things, including confidence, encouragement, and trust. When you are in a marriage you are in a great position to either build up or break down your spouse. Cherish this position. You may not always like what you hear but give it a chance…maybe they are right. When you understand each other and develop an openness you will have a great effect on others around you. For example your children, your single friends, and your married friends. You will be able to support those that are married and vice versa. Carrying each other through the tough times. Your team will grow over time. You and your partner teaming up with others to be there for each other. I ask the question again. 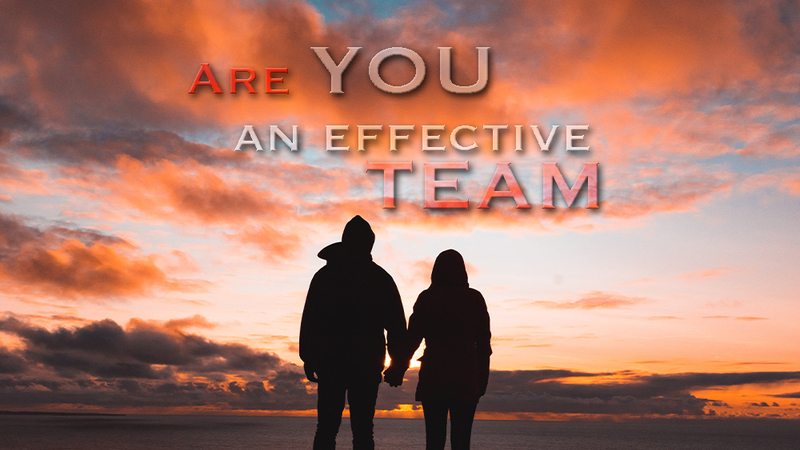 Your marriage, your family, your friends…Are you an effective team? Life is to be enjoyed with others. Be there for each other no matter what. Fill in your email address below. All emails are strictly confidential as only myself and Fiona read them. Stay blessed and be strong. We are here for you so never hesitate to ask for advice. Great read..agree completely! Blessings from America! Thanks for the feedback, and a BIG hello to our American reader!